I was immediately impressed with the build of these microphones. They felt rock solid. Not knowing yet what the price point of the microphones was, I assumed that they were likely more expensive than other similar handheld models. I was very surprised to find out that they are less expensive than most all of the comparable handheld mics in this category. As I mentioned at the start, these microphones feel solid. They all have a decent weight to them and appear to be of very sturdy construction. The documentation is complete with all of the information you would need to know before using the microphone. The mics fit into the standard “Shure” style handheld mic clips. I will go on record saying that it is a good idea for any mic manufacturer to keep that standard. Having to run and find a special clip to use for a specific mic in the middle of a hectic show is not an option. All of the Lewitt mics had more output gain than their Shure counterparts, seemingly similar feedback rejection, and were very similar in overall sound quality. Let’s get into some of the details. I tested these microphones at The Good Hurt Nightclub in West Los Angeles, where I work FOH (front of house) two nights a week. I know the room, I know the gear*, and I know the bands. For me, the only new variable was the Lewitt MTP series microphones. With my labcoat on, I was able to hear the mics alongside comparable models at both lower price points (GLS Audio ES-57s and ES-58s) and higher (Shure SM57, SM58, Beta 58a, Sennheiser e 835 & e 845). Based on pricing, the Lewitt mics should fall right in the middle of these two categories. Based on the mics’ performance, I was surprised to find that was not the case: the Lewitt mics were generally indistinguishable from the Shures and Sennheisers. For the two-guitar bands, I ran the MTP 440 DM on one guitar cabinet and a Shure SM57 on the other. I could not hear a difference from one to the other. The 440 also did quite well on the snare drum and did a great job on a vintage Ampeg flip top bass rig. The MTP 240 DM and the 540 DM are the two moving coil dynamic vocal mics in the lineup. The difference between these mics was noticeable. I had no problems using either of the mics for all kinds of applications, but I primarily tasked them with vocals. The 540 had slightly less output due to the difference in impedance (280Ω compared to 300Ω), but an overall richer tone with smoother highs. The 540 compares more closely to the Shure SM58 in that respect. I did still prefer the 240 over the GLS Audio ES-58. 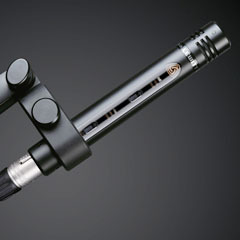 The MTP 340 CM is Lewitt’s handheld condenser microphone. This is an excellent mic in general. At its price, it stands out from the pack. This is the first affordable, great-sounding mic in it’s class that I have ever used! It was great on vocals and acoustic instruments. I even used it as a drum overhead with excellent results. With that kind of versatility and excellent feedback rejection compared to like designs, I can easily recommend picking up a couple of these for any venue. I did in many cases prefer this microphone on female vocals, and the 540 on male vocals in mixed gender bands. These two mics’ different sonic characteristics gave the vocals more space and a unique character to help each individual vocal stand out in the mix. The SM57 vs Lewitt 440 was a very close race. They were nearly identical on the reamping test I did on guitar. The tone is very similar, after compensating for the higher output of the Lewitt. The Shure is slightly rounder in the mids and is a bit smoother in the highs, but just slightly. A vocal test of the Lewitt 540 and 240 vs. the SM58 revealed more differences than the instrument mic tests. The SM58 took pops slightly better, and was not as sensitive overall as the Lewitt mics. The 540 was more similar to the standard SM58 than was the 240. The 240 was comparatively not as well defined, hot in the highs, and had the most output of the three. When used live, the differences were less noticeable and much less of a concern. I would say that the 240 is about the mid point in quality between the lower-end GLS Audio ES-58 and the Shure SM58. I would not hesitate at all to use these microphones in a live setting. They are solidly built, the feedback rejection was excellent, they have plenty of output gain, and best of all, they provide great sound quality. With live microphones, I do not normally stray from the classics, but if you want to save a couple bucks and sacrifice very little (if anything perceivable at all), check out the Lewitt MTP Series Performance Microphones for live sound. Second set of test subjects is a male and female acoustic duo. The female vocal is the lead and the male is the backing. I tried the 540 on her and the 340 on him. The dynamic [ 540] has a nice full range and balanced sound. Not too hot on the high end but enough for the vocal track without having to reach for EQ. The 340 on the male vocal is really nice. The backing vocals have a nice sheen to them and blend really well with the rest of the mix. Test number 3 was a Def Leppard cover band with a female singer. All the singers bring their own vocal mics so I was able to find some other interesting placements for the Lewitt mics. I used the 340 as a drum overhead for the live recording that the band requested. I listened to that track solo’d through headphones and it sounded great. The snare has a great attack and the cymbals are present without being hyped at all. The stick attack on the ride was great. The overall balance from that mic is excellent in this application. The 440 made its first appearance of the night on the snare. That track solo’d was quite nice as well. The drum was very well represented by the mic. With the addition of a Shure Beta 52A on the kick, the 3 mic setup is capturing a very nice and open drum sound. The 540 was sent off to work half stack guitar duty. The sound coming from the amp is very crunchy and the mic is doing a great job of bringing it to the mains. Test 4 is three male vocals with all three vocal mics. Clear natural sound out of the lead vocal on the 540. EQ is pretty flat except for the usual 100 Hz or so that I usually pull out in this room when there are several male vocals all singing together in a dense mix. I have the 440 on one of the guitar amps and a Shure SM57 on the other. Again, different sounds per amp and player, but both guitars sound great in the mix with their settings identical all the way down the channel strip. Thanks for the review. I have started to use almost all Lewiit mics during lives shows that I mix and I really enjoy their sound!